) * 1.1 kg * Dual Full Vestibule provides protection while still maintaining good ventilation when closed. * Dual Entry ensures each person has their own door for those nightly trips. * Single Piece Bathtub Floor makes a more watertight floor. * Easy Tensioning Adjustment makes keeping your the tent taut a trivial task that can be accomplished while still in your sleeping bag. * Floating Canopy allows the canopy to be set to different heights. * Dual Hiking Pole Support * Dual Cargo Pockets. * Extremely Easy Setup in less than five minutes under any conditions. Product Description Three words define the Lunar Duo. * Spacious—This tent is at home in a campground as much as a top a wind swept ridge. It’s large enough for four adults to sit up and play a game of cards. * Secure— No matter how bad the weather, you can batten down the hatches for a comfortable nights sleep. Or open both vestibules for fantastic views and excellent cross through ventilation. * Ultralight— Lunar Duo offers no compromises despite the fact that it’s less than half the weight of your traditional tent. Dual doors and vestibules give each person their own entry. Lunar Duo offers the most interior room of any tent in its class and weight range. Two curved spacer poles on either side create an arched roof with excellent room to sit up and change without constantly annoying your partner. The Lunar Duo's two vestibules can be open fully to create a lot of cross ventilation, thus keeping you cool and those pesky mosquitoes at bay. When closed, you can raise or lower the height vestibule to multiple positions to ensure you've got the right mix of protection, ventilation and view. This ultra light shelter offers dual doors and vestibules so each person has their own entry. With a height of 112 cm the Lunar Duo offers the most interior room of any tent in it's class and weight range. Two curved spacer poles on either side create an arched roof with excellent room to sit up and change without constantly annoying your partner. 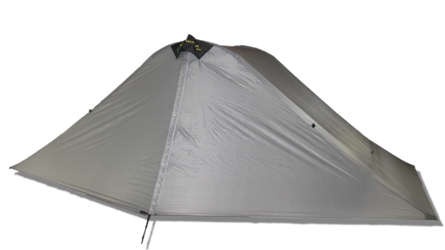 The wide canopy allows for vertical mesh sidewalls, thus eliminating the possibility of rain falling into the tent when you enter or exit. The high and wide canopy combine to generate a significant amount of space. You'll have plenty of room to move around in without bumping into the walls. Side entry provides room for oversize doors to ease entry and exit from the tent. It allows for oversize vestibules that provide plenty of extra weatherproof storage. A zipper closure of each vestibule keeps tensioning correct. Once open you chose fold back either door depending upon conditions. Packed Size 15" x 6"